Special new Zombies, Run! 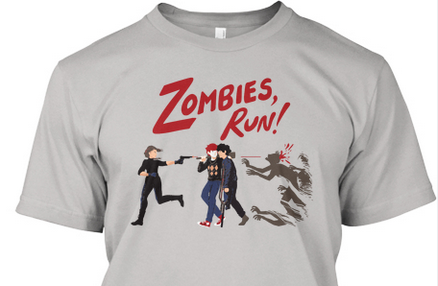 T-shirt available for a limited time – Zombies, Run! We’ve have a very special new limited edition tee design for you in time for Christmas! 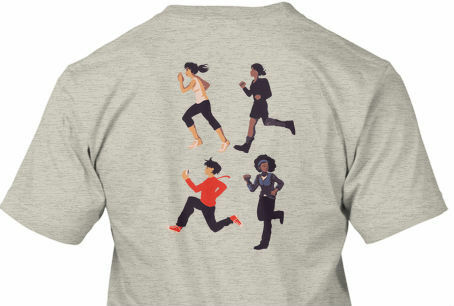 This special tee is the first that we’ve made that features character artwork*, and it’s by awesome fan artist Kascha Sweeney. On the front you’ll find Kascha’s designs of fan favourite characters including Radio Abel DJs Jack and Eugene being chased by zombies, while the back of the t-shirt depicts some of Abel Township’s most important residents. Can you guess who’s who? This will make a perfect Christmas present for your friends, family, enemies, and all current and future Runner 5s out there! Check out the Teespring page for more details, including sizing and colour info. Be quick, though: this design will only be available until Sunday December 8th. After that, there’s no guarantee we will be offering this shirt again! *Non-canon, in case you were wondering!